We offer a variety of attachments for the use with Moffett Mounty and other truck mounted forklifts. 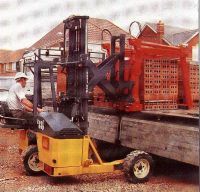 � These vary from the standard attachments commonly used with truck mounted forklifts to some unique load handling solutions. � We have solved many load handling problems using both �standard equipment and through the design and manufacture of bespoke �attachments. Sod Off System - Designed for the delivery of turf the 'sod off system' offer the ability to reduce pallet costs. � Combining the use of hydraulic reach forks and a folding T bar the turf can be pushed from a reuseable pallet and deposited at the delivering site. � The pallet in then retained and reused. Reach Forks - This equipment is commonly used on truck mounted forklifts. � These �can be used �to provide the primary reach for the forklift �or combined with an existing reach system to provide your Moffett Mounty with double reach and one side unloading.